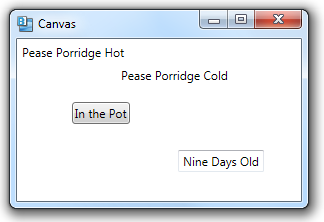 The Canvas panel serves as a container for a collection of child elements and allows positioning its children using exact coordinates (in WPF Units). You can specify the following attached properties for a child element of the Canvas, to control how the child element is positioned. If you don’t specify values for any of these properties for a child element, it will be positioned in the upper left corner of the Canvas.